OS grid reference NT 9305 4370. Three-quarters of a mile to the north of the village of Duddo in Northumbria stands the Bronze-Age monument known as Duddo Five Stones, which are actually the remains of a small stone circle. The five stone monoliths stand clustered together at the western side of Mattilees Hill beside a footpath in a field half-way between Grindonrigg and Felkington. Coldstream on the A698 is 6 miles to the south-west, while the nearest main road to the stone circle is the B6354. Scotland is 4 miles to the north. The five stones stand upon a low, grassy hill (tumulus) and cover an area of 10 metres or nearly 33 feet. It’s likely the circle of stones marks the site of a prehistoric burial, dating from the Bronze-Age upto 4,000 years ago; the stones being erected over this as a sign that it was, and still is, a sacred place where a chieftain or some other notable person(s) lie buried, perhaps several members of an ancient tribe? The tallest of the stones is 2.3 metres high or 7 foot 6 inches; the other stones are less high and vary in size from 1.5 metres to 2.1 metres (5 foot to 6 feet 10 inches) high. Originally there were seven standing stones, but the other two were lost in c1850. During excavations in the 1890s and early 1900s two holes were uncovered indicating where the other two monoliths had stood and some bones and charcoal were found. One of the stones had later toppled over which had led to Ordnance Survey recording on their maps that the site was called Duddo Four Stones. Luckily this stone was re-erected in 1903; and one or two of the other stones may not be (in situ) in their original places. Aubrey Burl, the well-respected English archaeologist, has visited the site on a number of occassions since the 1970s. Over the centuries The Duddo Stones have aquired many strange names owing perhaps to the deep grooves that can be seen in all the stones – caused by 4,000 years of erosion due to rain and wind that often sweeps relentlessly across the hills and moors and, because the stones are made of sandstone rain running down the sides has made strange grooves or gulleys. 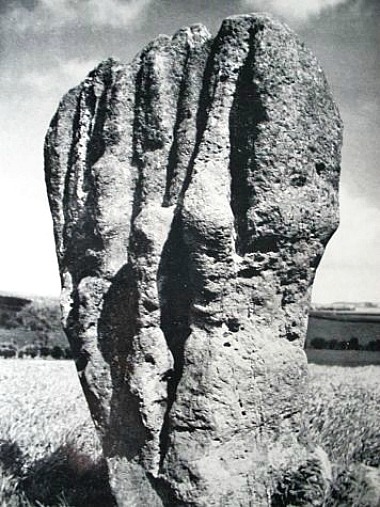 The largest stone has been likened to “a clenched fist rising menacingly out of the rough turf,” according to Garry Hogg in his book Odd Aspects of England. One legend says that seven people working here on the Sabbath day were turned to stone as a warning to other locals. Other names include: ‘The Singing Stones’, ‘The Women’ and ‘The Seven Turnip Pickers’! The largest stone has possible cup-marks and there are said to be cup-markings on one or two of the other stones. Duddo Five Stones is said to be aligned with the Winter solstice. The circle is in the ownership of English Heritage. Hogg, Garry., Odd Aspects of England, David & Charles, Newton Abbot, Devon, 1968. Bord, Janet & Colin., Ancient Mysteries of Britain, p 208, Diamond Books (Harper Collins Publishers Ltd), 1991. 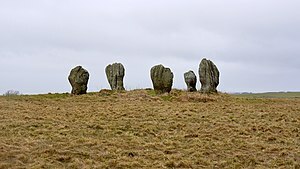 Categories: Duddo Five Stones in Northumbria, Stone Circles | Tags: Duddo Five Stones in Northumbria | Permalink.